Daybreak Pacific/Regent Ent. - 87 min. Cast: Mimi Rogers, Ted Shackelford, Bruce Allpress, Paul Gittins, Jon Brazier, Ben Castles. 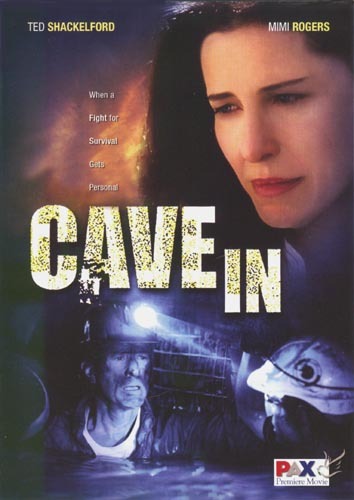 Long concerned over safety issues at the mine, Pat Bogan (Mimi Rogers) finds that her worries are confirmed when a cave-in occurs, trapping seven workers. Among those entombed are Pat's own husband Chief (Ted Shackelford) and their son Rabbit (Ben Castles). With the oxygen supply running out -- and water surging into the mine's tunnel -- Pat feverishly oversees the rescue efforts, battling every inch of the way with the "instinct over technology" policies of the mine's former superintendent, her own father Cappy (Bruce Allpress). A US/NZ co-production inspired by the real-life rescue of several miners from a collapsed tunnel in North Carolina; although it was filmed in the Auckland area, with the movie setting being West Virginia. Both the NTSC and PAL dvds are R0. The format is 1.78:1 (16:9 Enhanced), although the ntsc slick incorrectly says 1.33:1, with a 2.0 dolby digital English soundtrack. There are no subtitles. The only extra is a 2+ minute trailer. It is available from various Canadian and U.S. resellers for about $10us. Although as of August 2011 the ntsc version is OOP, there seems to be many new and used copies still available. New PAL versions are available from Australian sources for about $30au.